The roots are also used with those of dandelion to make the old country Dandelion and Burdock wine - that sold commercially now not having had either of those two plants anywhere near the bottle! Look in our book section for old wild food recipe books. 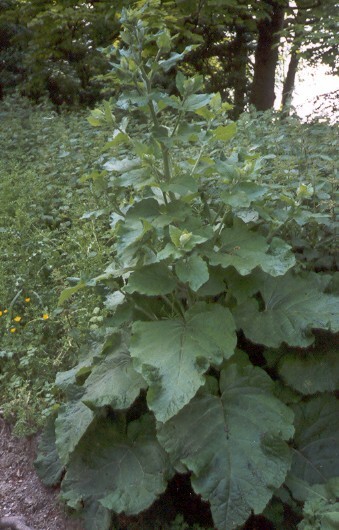 Greater Burdock, Arctium lappa is a bold impressive biennial plant with dark green leaves that can grow up to 18" (45 cm) long. They are generally large, coarse and ovate, with the lower ones being heart-shaped. 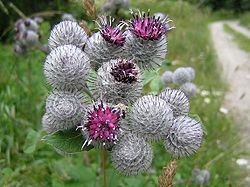 Arctium species generally flower from July to October with a pinkish-purple thistle-like flower very attractive to bees. The prickly seedheads of these plants are noted for easily catching on to fur and clothing, thus providing an excellent mechanism for seed dispersal and the original inspiration for Velcro! Some good-sized plants currently available.